When the original film came out in 2002, I made what was quite possibly the worst blunder in the history of BOP monthly forecasts. I picked Ice Age to not finish in first place for the month. So, which box office powerhouse did I feel would usurp the instant animated family classic? Resident Evil. Hey, I was only off by $135 million, give or take. At the time, I had yet to learn a valuable lesson about box office behavior that has since been beaten into my psyche. I will never ever never understand how to gauge projects like this...unless I start hanging out with soccer moms and frankly, I'm just not that passionate about being right. Nothing is worth spending a couple of hours being bored to tears pretending to care about what Doris heard Frank's been doing at the Pussyfoot Club. She knew he was into champagne room shenanigans when they met, after all. But I digress. The point is that I'm genuinely bad at predicting the success of children's films and Ice Age was the first demonstrable proof of it. Fool me once, shame on that damn squirrel and his ever-vanishing nut. Fool me twice only by releasing Resident Evil 3 this month. Fortunately, I caught a break here and we're between zombie sequels. Folks, this has been a roundabout way of stating the obvious. Ice Age 2 has killer advertising which hides some genuinely atrocious animation, particularly of the humans. It's going to make a ton of money and there is unfortunately not a damned thing any of us can do about it. A is for apples. J is for jacks. And M is for money. Lots and lots of money. V for Vendetta will make a ton of it. The seminal graphic novel from the 1980s is finally being brought to the big screen with the Wachowski Brothers overseeing the project. So, we have Alan Moore's writing brilliance tied to the guys who did The Matrix trilogy. That sounds like a match made in heaven. Why, then, has V for Vendetta had to fight such overwhelming negative buzz? A lot of the problem is Moore himself. The dude redefines the mad genius theory. He took time out from his busy schedule of worshipping a snake goddess (note: not a joke) to randomly announce he hated what was being done with all of his movie adaptations. As was the case with From Hell, League of Extraordinary Gentlemen and Constantine, he wanted nothing to do with this film. Then, the project was delayed into 2006, causing more nervous titters about its quality. Also, the last Wachowski brothers film, The Matrix Revolutions, was not exactly hailed as landmark cinema...at least not in a good way. When the latest trailer came out, though, I stopped worrying about the behind-the-scenes stuff and focused on the obvious. V For Vendetta looks freaking phenomenal. I even toyed with the notion of making it my number one film of the month, meaning I see it as having $150 million plus potential. 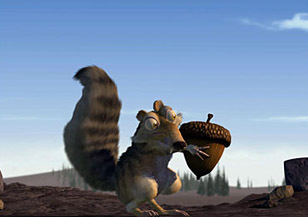 In the end, I remembered my prior mistake on Ice Age and decided not to let history repeat itself. The final March totals should be very interesting, though. There has not been a strong comic book adaptation since Fantastic Four. That one opened to $56 million...just something to think about. Wes Craven's first directorial effort was not The Hills Have Eyes. It was, however, unquestionably the project that brought him the acclaim his talent has justified throughout an illustrious career. Capitalizing on the atomic fear so prevalent in the middle of the Cold War, Craven took a simple premise of the fallout of nuclear testing and turned it into a horror institution. The key was the creation of characters named after planets Pluto, Mercury, Mars and Jupiter. It's Pluto as played by bullet-headed Michael Berryman who has stood the test of time. With all of the staples of the genre getting a new millennium revision, it was only a matter of time before someone got around to this classic. Unfortunately, the director in question is Alexander Aja, who somehow created a buzz with the wildly illogical Haute Tension. Having failed on a dramatic scale with his last offering, it's frightening (and not in the good way) to imagine what he will do to this horror standard. But the little girl in the commercial is creepy, so maybe I am being needlessly pessimistic. Under any circumstance, there are two types of horror film box office performances. There are the good and the great. This will fall into the latter category. Tim Allen, who once served two years in prison for cocaine distribution, returns in yet another Disney family classic. This makes him the second least appropriate role model in their acting rotation, albeit a distant second behind Lindsay Lohan. Allen takes on the role made famous by Tommy Kirk (*not* Fred MacMurray) in the 1959 classic. Unlike the 1994 Ed Begley Jr. television re-make, this is not a re-telling of the same premise. Instead, rubber-faced Tim Allen will be given the difficulty acting assignment of impersonating a dog (with a little help from CGI here and there). All of the sarcasm I can muster is not going to change the fact that people like dogs and people like this particular reformed drug trafficker. The Shaggy Dog is going to be a solid hit for Disney, and Lohan won't see a dime of residuals for this one! The easy choice for star power contender of March, Inside Man is frontlined by Denzel Washington, Jodie Foster and Clive Owen. Between them, that is zero good movies in 2005 out of approximately 17 attempts. So, depending on perspective, they are either all overdue for a great ensemble drama or each of them needs to fire their agent with gross prejudice. This project is particularly complicated to me, because the trailer somewhat spitefully gives away all the big secrets in the movie. No matter, it will do very well at the box office simply due to the presence of its impressive trifecta of leads.